CooperVision has extended its range of contact lenses to include Avaira Vitality Toric. These bi-weekly contact lenses have been introduced by the manufacturer as a replacement for the current Avaira Toric lenses. CooperVision laboratories worked to improve their flagship toric lenses, and the result is Avaira Vitality Toric lenses, which are made of a silicone-hydrogel material (Fanfilcon A) that has a 55% water content and an oxygen permeability of 90 Dk/t. 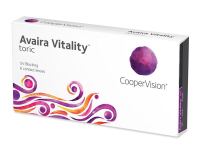 Avaira Vitality Toric contact lenses are also available in a smaller 3-pack. Avaira Vitality Toric contact lenses are specially formed using the brand’s patented Optimized Toric Lens Geometry. In practice, this means that these astigmatic lenses have a uniform thickness that helps the lens remain in a stable position on the eye, thus improving the comfort and quality of vision. The lenses‘ ballast stabilisation technology helps reduce friction when blinking for greater comfort. Last but not least, this lenses‘ have a large optical zone for astigmatism correction, so your vision is never limited. Avaira Vitality Toric lenses feature a class 1 UV filter, which is able to block 90% of UVA and 99% of UVB radiation. However, UV-absorbing contact lenses are not substitutes for protective, UV-absorbing eyewear. Proper sunglasses will provide UV protection to the entire eye area. The Best Avaira Lenses Yet! After rigourous testing, CooperVision has found that users noticed a significant improvement in comfort and quality of vision after one month wearing Avaira Vitality Toric lenses.